Returning to Rochester soon after the great performance of his Debussy/Ravel project in Kilbourn Hall during the 2012 Rochester Jazz Festival, Exodus to Jazz is briging Tom Harrell to town this week on Thursday night at Hochstein Performance Hall. Harrell will be appearing with his group TRIP, including Mark Turner on tenor sax, Adam Cruz on drums and Ugonna Okegwo, his bassist of 13 years, before moving on to the Festival of New Trumpet Music at the Jazz Standard in NYC. Neither aggressively avant-garde nor focused on the past, neither steeped in the language of bebop nor entirely free from it. Harrell's music simply celebrates sonic beauty for its own sake. His music is always fresh, innovative, and often quite beautiful. I have never been disappointed. Neither have others. 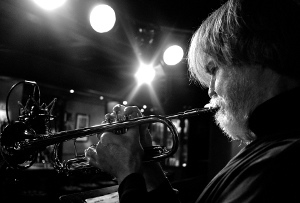 Tom Harrell is a frequent winner in Down Beat and Jazz Times magazines' Critics and Readers Polls and a Grammy nominee. Harrell also has been nominated for Trumpeter of the Year two years in a row for the 2010 and 2011 Jazz Journalists Association Awards. Harrell's appearance here at the Rochester jazz festival in 2006 and again this year with his Debussy/Ravel project were highlights of each year. I encourage you to come out for this performance, which will likely soar in the great sonic space that is Hochstein Performance Hall. Buy tickets:	Advances Sales:	Onsite at all Wegmans stores (Rochester, Buffalo, Syracuse); Online at Brownpapertickets.com; At the Door: At each venue beginning 7:00pm, night of concert. The late Dutch saxophonist, composer & bandleader Willem Breuker had been here many times to play, mostly in concerts sponsored by Tom Kohn and The Bop Shop. Breuker passed away in July 2010 and his band the Kollecktief is touring one more time before moving on. A broad, intense and intricately layered sound .... we're going to miss their stops by ROC. Jazz Around Town: Got yer jazz listings rightchere! No more festivals, my friends. That's even though we had a couple extra after the usual end with the Clothesline. Fringe Festival was a big success; hope to see more music (and, of course, jazz) next year! I'm afraid that now t's time to start battening down the hatches for the winter months. And now for a bit of ask... I'm walking in the American Cancer Society's Making Strides Against Breast Cancer Walk this coming Sunday and hope that some of you can help me beat my modest goal. This terrible disease has touched both friends and family for me ... plus I need the exercise! We've compiled these listings from information obtained from the performing artists themselves and other sources. 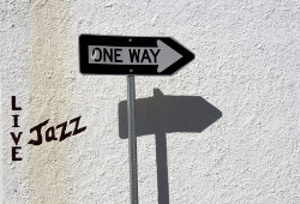 The aim is to give you a one-stop place to find all your jazz in Rochester.The aim is to give you a one stop place to find all your jazz in Rochester. Only start times are listed, visit or call the venue for more details (the sites for many of the venues are in the right panel). Please forgive any discrepancies with reality and feel free to let me know what the problem is, and I'll get the corrections up on the site as soon as possible (click on the "Contact Us" button above). If you go out to hear a performance listed here, feel free to drop a comment to this post to let us know how it went. I want to hear from you! Bucky Pizzarelli swings through a number at tonight's Exodus To Jazz concert with his trio of bassist/vocalist Nicki Parrott and vibraphonist/drummer Chuck Redd. The First Niagara Rochester Fringe Festival (now the bookend festival of the Rochester festival season?) begins its run through Sunday tonight. I'll try to get all the jazz and jazz. Let me know if I miss anything because I haven't seen the listing (or it's "beyond the Fringe"). Guitarist John "Bucky" Pizzarelli is one of those cats that has been at it for over 50 years, keeping that mainstream and traditional jazz alive for audiences around the world. Exodus to Jazz is bringing Bucky here a rare Rochester appearance this Saturday, September 22nd, at the Hochstein Performance Hall. Pizzarelli brings his trio of bassist/vocalist Nicki Parrott and vibraphonist/drummer Chuck Redd for the ETJ concert. In addition to work on television, Bucky Pizzarelli has has worked with a long list of musicians Pizzarelli over his career, including Les Paul, Stephane Grappelli, and Benny Goodman. Bucky is the father of jazz guitarist John Pizzarelli and bassist Martin Pizzarelli, whom he also works with from time to time. Pizzarelli looks to Django Reinhardt, Freddie Green, and George Van Eps as influences on his style of playing his seven-string guitar (the extra string is used to play a bass line on his solos). Although known for his playing an archtop, Bucky is also an accomplished classical guitarist. Cyrille Aimee & Diego Figueiredo doing some samba at theJazz At The M.A.G. Series. Various @ Greentopia EcoFest, High Falls Festival site (see site for groups, times and venues). Roney and his young quintet (a bit older, Essiet Essiet was a last minute sub on bass) kicking it at the Lutheran Church of the Reformation. Visiting the Site Itself. 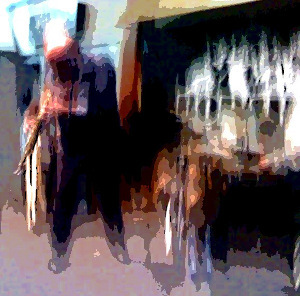 You may have reached this blog by searching for "jazz in Rochester" or for a gig you've heard about, via word of mouth, an image, or merely by accident through your favorite search engine. You may just check in once in awhile or check on Wednesday or Thursday to see what's coming in the next seven days. However, it is not the only way to visit. Jazz@Rochester via Email. About 300 of you get your Jazz@Rochester via email. By doing so, you receive every post that we publish via an email, with links and, usually, the image. Some of you actually think that I send those emails out, but they are syndicated from the feed for the blog via a service called Feedburner. If you'd like to receive the posts via an email, enter the email address you'd like to receive it on in the box to the right under "Connect with Jazz@Rochester" that is labeled "Enter your email address:" I do not sell, spam or otherwise use the email addresses entered in there. You will receive an email to confirm your email address. Click on the link and you're subscribed. You can quit your subscription at any time by clicking on a link at the bottom of each email. Jazz@Rochester via a Feed. Nearly 200 of you have put the feed for Jazz@Rochester in a feed reader like Google Reader and also receive the feed of posts as they are published. 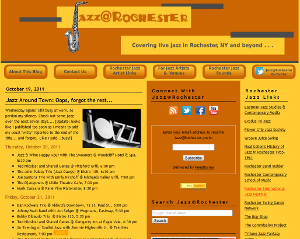 To do that, you can click on the orange RSS feed icon directly under the "Connect with Jazz@Rochester" heading. Choose the reader you use and it will pull the feed as they are published. Jazz@Rochester on Twitter. I tweet under the handle @jazzrochester (go figure...) and almost 3,700 Twitter users are following the blog there. In addition to "tweets" that have a link to the posts published on the blog, I follow the jazz artists locally who are on Twitter (at least those who I know are on Twitter) and others in the jazz community here. They are in the Rochester Jazz Artist Twitter list that I have created. There is also a vibrant jazz community on Twitter with artists, jazz bloggers and jazz organizations from all over the world and I try to bring them to you as well. Please let me know if there are other Rochester jazz artists who "tweet" so I can add them to the list and follow them. You can access the feed on Twitter by clicking on the Twitter icon in the "Connect with Jazz@Rochester" area in the center column. Jazz@Rochester Page on Facebook. Nearly 500 folks have "liked" the Jazz@Rochester page on Facebook. I added this for the many of you who find Facebook your platform of choice, so you could would have access to the posts published on the blog as well as jazz links and for the local artists on FB to let you know what's going on with them. Feel free to add your two cents in about the Rochester jazz scene. I'd appreciate it if you'd head over to the page and "like" us there, even if you're getting the content some other way. You can get to the page by clicking on the Facebook icon in the "Connect with Jazz@Rochester" area in the center column or the link above. Jazz@Rochester YouTube Channel. On this channel I'm beginning to collect video of Rochester jazz artists performances and performances from the Rochester International Jazz Festival. I also subscribe to several jazz-related video feeds. Feel free to let me know about video you've found that can be added there. Access it by clicking on the YouTube icon in the "Connect with Jazz@Rochester" area in the center column. Jazz@Rochester is Mobile. The site is mobile enabled and it should send you to the mobile site if you connect from a smartphone. If not, point it to m.jazzrochester.com. Please note that this sometimes does not update as quickly as the page itself. Rochester Jazz Artists & Groups. I try to link to the websites of local jazz artists and groups. Just click on the tab at the top of this post. Links. I've collected a number of links over the years to jazz information, media and other resources. I also try to add other resources that feed links to other jazz-related information. Looking Backward? You can use the search box just under the "Connect with Jazz@Rochester" to find posts that include a particular artist or click on a category or monthly archive link in the left column to browse through posts. So subscribe, "like," or consume the content here any way that works for you. I'll just focus on getting you information about live jazz. Feel free to send us a question or information via email by "Contact Us" button at the top of the blog under the banner. If you have any questions, don't hesitate to ask... here, via email, on Twitter, on Facebook, by commenting on a post, or even if you see me at a gig. In essence, I've been trying to build a community around live jazz here in Rochester, which has made and is making so many contributions to jazz and will slowly fade away if not supported. I love the music, so I can't sit by and let that happen. I encourage you to join the community. Various @ Greentopia EcoFest, High Falls Festival site, Saturday & Sunday, September 15th & 16th (see site for groups, times and venues). Kicking off the exciting and diverse 2012-2013 lineup of the Exodus to Jazz concert series is trumpeter Wallace Roney with his septet on Saturday, September 8th at the Lutheran Church of the Reformation at 8:00 pm (see the 411 below for more details or the Exodus to Jazz website). 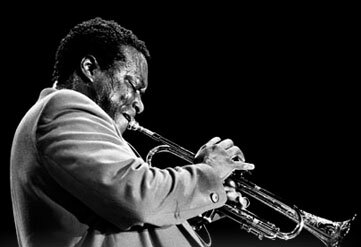 Wallace Roney established himself in the mid-1980s, succeeding Terence Blanchard in Art Blakey's Jazz Messengers in 1986. In the late 1980s and early 1990s, he was an integral part of Tony Williams's quintet. In 1991, Roney played with Miles Davis at the Montreux Jazz Festival and after Davis's death that year, toured in memorial tour with former Miles collaborators Wayne Shorter, Herbie Hancock, Ron Carter and Williams and recorded with them the Grammy-winning Tribute to Miles record. Roney has worked with Art Blakey, Elvin Jones, Philly Joe Jones, Walter Davis Jr., Herbie Hancock, Tony Williams, Jay McShann, David Murray and McCoy Tyner, as well as appearing as a featured soloist with Ornette Coleman, Sonny Rollins, Curtis Fuller, Carole King, Joni Mitchell and Dizzy Gillespie. He won the 1990 Downbeat Critic's Poll as Best Rising New Trumpeter. After graduating from Berklee College of Music, Wallace Roney learned much of his craft directly Miles Davis, studying with him from 1985 through his death in 1991. Roney is capable of a perfect imitation of Davis, fooling seasoned jazz listeners andcritics have taken him sounding too similar. However, Roney has his own sound and relationship with the music. As critic Ron Wynn wrote in Rovi, "[Roney's] trumpet tone, timbre, approach, phrasing, and sound so closely mirror that of Miles Davis in his pre-jazz/rock phase that he's been savaged in many places for being a clone and unrepentant imitator... It's a classic no-win situation; he does sound tremendously like Davis and can't be completely absolved from critical charges of imitation. But he's also a fine, evocative player on ballads and can be fiery and explosive on up-tempo tunes." His albums are fully within the hard bop/post-bop tradition, but he mixes a lot of other influences in as well. Now recording for the HighNote label, Roney's most recent CD is Home (affliate link). Date & Time: Saturday, September 8th, 8:00 pm, doors at 7:00 PM. Concert will be two one-hour sets with a 20-minute intermission. Tickets:	Advanced Sales: Patron - $40; Premium - $30; General Admission - $25. At the Door: Patron - $42; Premium - $32; General Admission - $27. Advance sales tickets can be bought at all Wegmans stores (Rochester, Buffalo, Syracuse) and online at Brownpapertickets.com, or at the door.